RPF rally in Gicumbi, Rwanda 2010. Image credit Graham Holliday via Flickr (CC). At the end of May 1997, one week after President Mobutu was toppled in a military coup, Judi Rever, a Canadian reporter for RFI, arrives in the Democratic Republic of Congo—then Zaire—to cover the unfolding humanitarian crisis. She travels south of Kisangani to refugee camps where Hutu refugees have sought safety after a series of attacks. Here, in the eery quiet of a clearing in the forest, she comes across “dozens and dozens” of survivors. Some have lost their families and others look as though they are “on the verge of death.” They all say they are escaping attacks by the RPF, the Rwandan Patriotic Front, part of the rebel alliance that has overthrown Mobutu (today, the ruling party in Rwanda). Across the border in Rwanda, in a transit camp where Hutus returning from Congo are being registered by the UN, refugees say the same thing: that they fled Rwanda to Congo because the RPF was killing Hutus. Back in Paris where she lives, Rever tries to piece together what she has seen. In the media and in political and humanitarian circles, there is one narrative: that “an African renaissance” is beginning in the Congo, heralding a “new age of peace and security.” Rever herself believes, like most people, that during the Rwandan genocide the RPF “swooped in and routed Hutu extremists responsible for killing Tutsis and moderate Hutus.” Yet this narrative is “diametrically opposed” to what she has seen in both Congo and Rwanda. Her interviews lead her to question everything she has read about the genocide. What unfolds in the remainder of her book, In Praise of Blood: The Crimes of the Rwandan Patriotic Front, is a detailed account of the RPF and their crimes before, during and after the Rwandan genocide. Drawing from reports by the International Criminal Tribunal for Rwanda (ICTR), which was set up in the aftermath of the genocide to try Rwandans accused of human rights violations, as well as from select interviews with former intelligence officers and RPF defectors who used to work for Kagame, Rwandans in exile, survivors of massacres, former investigators, academics, and others, Rever’s account reveals the RPF’s methods of operation. It says how they carried out massacres against Hutu civilians “with great precision,” “leaving barely a trace,” what motivated them, and how they managed to evade justice for so many years. Although these crimes have been documented for many years and as early as 1994 by groups including The Human Rights Commission on Rwanda, Amnesty International, the UN, MSF, and a number of notable scholars, In Praise of Blood is notable for providing more information, both “qualitative and quantitative,” about the RPF’s crimes. 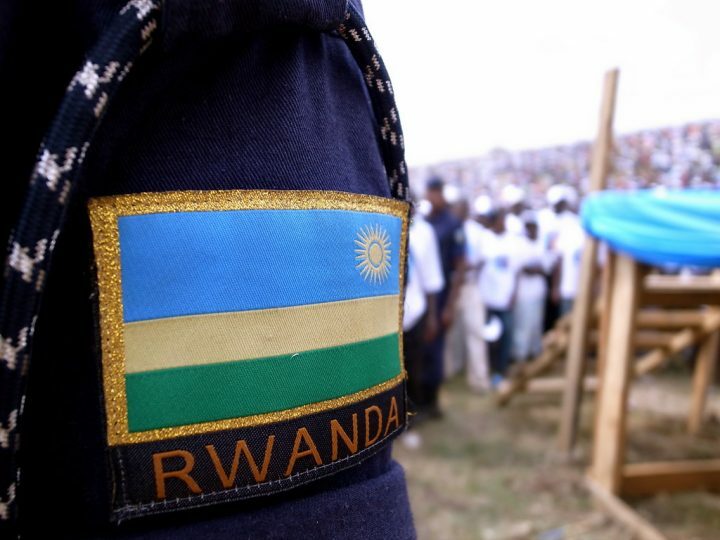 A key element to understanding the RPF’s operations during and after the genocide, is its intelligence wing, the DMI (Directorate of Military Intelligence), which Rever describes as the “main instrument through which crimes were inflicted on Rwandans during the genocide” and the “continuing source of control and violence against Rwandans and Congolese.” Investigators for the ICTR found that while the RPF had killed civilians, it was DMI representatives under orders from Kagame who initiated massacres. A controversial revelation in the book, based on the ICTR report and on interviews with former RPF officials, is that a covert group of “technicians” trained by DMI before 1994 were trained to, among other things, infiltrate Interahamwe Hutu militias and incite them to commit massacres against Tutsi civilians. In some cases, she writes, the RPF even actively killed Tutsi villagers in staged attacks that were blamed on Hutu mobs. In Praise of Blood details several other massacres by the RPF, including at Karambi trading center, where the RPF killed an estimated 3000 people before President Habyarimana’s plane was shot down, at Ruhengeri where DMI units with civilian cadres massacred Hutus in July and August of 1994, at Gabiro in a guest lodge that had once been the home of Rwanda’s king, and at Giti. Giti stands out as a “startling use” of RPF “propaganda” where RPF forces massacred Hutu civilians at a primary school in Giti and then agreed with the town’s mayor that in return for RPF protection, he would be known as the only mayor in Rwanda who had ensured that no genocide against Tutsi took place in his commune. While one might categorize the 1994 killings by the RPF as specific to the violence unfolding in the context of genocide, what happened after the genocide during the counter-insurgency when Kagame sent his troops into the DRC under the pretext of hunting down Hutu génocidaires is arguably more disturbing, perhaps for the simple reason that unlike the genocide, Rever states, it went on with “little outcry from the world,” reaching its peak in 1997. The 1996 invasion of Zaire forced hundreds of thousands of Hutu refugees to return home and “face a new round of ethnic cleansing.” Rever writes how during this period, RPF killed Hutu civilians in areas under their control “hill by hill,” including near military bases, and in caves where thousands were hiding from Kagame’s soldiers. Meanwhile, Hutu officials who were unwilling to support the Hutu insurgency and joined the RPF were also killed, along with their families. Some of these massacres have been confirmed in reports by Amnesty International. Although the killings in these years targeted not only Hutu and Tutsi civilians, but also UN observers, Spanish aid workers and a Canadian priest, no action was taken against the RPF internationally. As early as May 1994, during the genocide, a UN refugee agency report documented killings by the RPF. After the genocide, in 2006, a French judge, Jean-Louis Bruguière issued arrest warrants against those involved in the shooting down of Habyarimana’s plane and in 2008, Spain issued arrest warrants for 40 of Kagame’s senior commanders, but these did not result in any arrests. Rever writes that authorities in Europe, North America and Africa refused to extradite those implicated. In 1997, when the Canadian priest was killed by RPF and a witness flew to Nairobi to give a statement to the Canadian embassy, there was no follow up. The latter chapters of In Praise of Blood offer startling explanations of what was happening in the higher echelons of institutions tasked with pursuing the RPF and the “enormous lobbying, money and influence” Kagame used to “penetrate institutions and people in power.” Rever exposes how a clandestine unit, the Special Investigations Unit, which was set up by the ICTR in 1999 specifically to investigate crimes by Kagame’s army and relied on testimonies from Rwandan witnesses in exile, found that their sources were being intimidated and disappeared. The ICTR suspended investigations against Kagame’s commanders in order not to lose the cooperation of the Rwandan government in investigating Hutu génocidaires. Eventually, Rever writes, the SIU was hijacked by Paul Kagame himself, and the Chief Prosecutor, Carla Del Ponte removed from her position “at the behest of the US” after she made it clear that she intended to indict RPF commanders. In a stunning revelation that demonstrates just how intertwined the relationship between Rwanda and the US was, In Praise of Blood demonstrates how Kagame and the US Ambassador at the time agreed to a deal whereby, rather than going through the ICTR process, the government of Rwanda would have the “opportunity” to prosecute massacres by the RPF. In other words, “the killers would investigate themselves.” Rever writes that the ICTR became essentially “a surrogate of Washington and by extension, Kagame.” The UN tribunal closed in 2015, having convicted 61 people, all of them linked to the former Hutu regime. The trial that Rwanda eventually carried out on its own was seen as a “political whitewash,” even by Human Rights Watch, which Rever demonstrates was primarily interested in massacres of Tutsis in the genocide. For those implicated in massacres, not only were they not prosecuted, but several moved onto high positions in UN peacekeeping operations; Patrick Nyamvumba who allegedly gave the orders for massacres during the genocide and was in charge of creating units to “screen, mop up and otherwise rid the hillsides of Hutu civilians,” was appointed as Head of UNAMID, the UN-African Union peacekeeping operation in Darfur in 2009. Another man, Jean Bosco Kazura, allegedly in charge of soldiers who killed civilians east of Kigali at the height of the genocide and at Gabiro, became the peacekeeping chief of the UN’s force in Mali in 2013. Any attempt to uncover the carefully buried secrets of a powerful regime is likely to result in reprisals. In Praise of Blood describes what happened to Rwandans who came forward to testify against Kagame and the RPF. While some managed to escape into exile, others were killed, disappeared or imprisoned. Rever writes how she too became a target, not only in Europe where she travelled for interviews, but also in Canada where she received threatening calls singling out her children. At the end of her book, Rever writes that she chose to focus on the crimes of the RPF and not on the genocide against Tutsis since there already exists a plethora of material about Hutu-on-Tutsi violence. However, for this reason, it is sometimes difficult while reading In Praise of Blood to keep the two narratives in mind and to understand how both unfolded simultaneously within the same time period. Some parts of the book raise questions. For instance, Rever writes that eight per cent of the Hutu population actively engaged in killings against Tutsi and that “the majority of Hutu civilians did not kill their neighbours.” Others, including Mahmood Mamdani, whose book When Victims Become Killers tries to make sense of the killings, assert that contrary to Rever’s claim, hundreds of thousands of ordinary people participated in the genocide. Other claims in the book which may require further substantiation include a citation from the University of Rwanda which estimates that forty thousand civilians had been killed by the RPF in two regions of the country by early 1993. That is a colossal number by any standard and difficult to understand how such a large number of killings could go unnoticed well before the genocide began. Disputes over numbers are common in the divergent accounts of the Rwandan genocide. Rever estimates that based on her evidence and that of the ICTR investigators, the RPF killed between several hundred thousand and one million people. A proper judicial investigation would be required to determine whether or not a genocide against Hutus did take place. Filip Reyntjens at the University of Antwerp argues that although he is not one to advance the thesis of double genocide, the massacres may indeed demonstrate an intention to destroy Hutu, a strong indicator being the separation of Tutsis and Hutus, and the use of help from Tutsis in killing Hutus and sparing Tutsis. Given that the crimes of the RFP will likely go unpunished, and that the judicial truth will not be established, he says, “the historical truth can and must be sought.” To this end, Rever’s work remains significant. In his book, Mamdani writes that “Violence cannot be allowed to speak for itself, for violence is not its own meaning. To be made thinkable, it needs to be historicized.” In her final chapter, Rever quotes an opposition Tutsi activist who argues that the RPF killings are not reprisals for the 1994 genocide against Tutsis, but rather, revenge for 1959, when waves of Tutsi were forced to flee during the 1959 revolution and the country transitioned from a Belgian colony with a Tutsi monarchy to an independent Hutu dominated Republic. Likewise, in Mamdani’s work, he makes the claim that “The failure to address the citizenship demands of the ‘external’ Tutsi marked the single most important failure of the Habyarimana regime.” There is no doubt that understanding the deeper roots of RPF violence, and by extension, the regime in place today, requires venturing back into the complex and difficult history of Rwanda and the region. The official narrative of the genocide, which claims that Tutsi victims were rescued from Hutu killers by the RPF, has persisted for decades, rendering the stories of one side continuously visible and subject to official commemoration while actively silencing the memories and stories of the other. This narrative has no doubt served Kagame’s regime extremely well as he continues to receive awards, adulations, over 984 million dollars in aid in 2015/2016 and unwavering support from the likes of Howard Buffet and Tony Blair. Even his decision to rule until 2034, Rever notes has drawn “only tepid criticism” from Washington and London. In the words of Theodore Rudasingwa, Kagame’s former Chief of Staff, who spoke in the BBC documentary, Rwanda, The Untold Story, “Kagame’s impunity has reached scandalous proportions,” and the cost in terms of lives destroyed in both Rwanda and the DRC has been colossal. In Praise of Blood is a courageous, powerful and meticulously documented work that counters the narrative on which Kagame’s impunity rests, resurrects the memories of countless people, and brings their stories out from the silence and the intricate machinery of fear that the Rwandan regime has worked so hard to maintain.